I mentioned Ask A Librarian (AAL) before: an online chat service libraries provide for the public and students to ask questions and request research. At the university/college level it's for students stuck off-campus to get help finding online research or figure out what they need for assignments. At the public library level: we're for home-schooled or virtual school students and for middle/high school students; or for adults needing help with placing holds, figuring out ereaders, and whether or not their library card numbers are still valid. It's a state-wide program: a lot of the county and city libraries provide staff to give an hour or two a day at least once a week. We get about four questions an hour, usually from the big systems like Jacksonville, Broward, Tampa/Hillsborough, Miami/Dade, Orange County (Orlando), sometimes Lee and Monroe. The quirky ones are the ones out-of-state: I had one from Shasta College... one from Bolton (UK!)... anyway I digress. 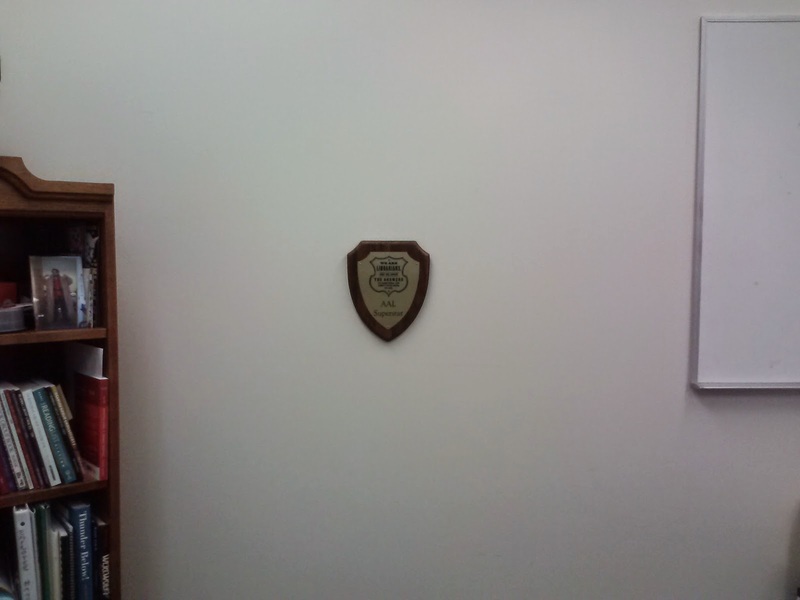 Every month, the organization overseeing AAL gives out a couple of staff awards. 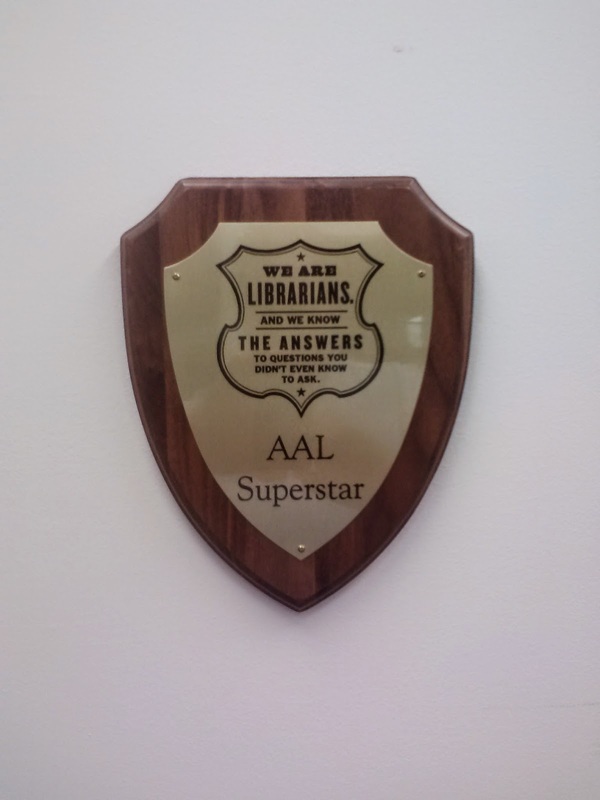 There's one for the librarian who provides extra effort to make sure most of the hours are covered as best as possible, called the Superstar award. There's a plaque for it! Paul is the Reference and Computer Librarian at the Bartow Public Library which is part of the Polk County Library Cooperative. 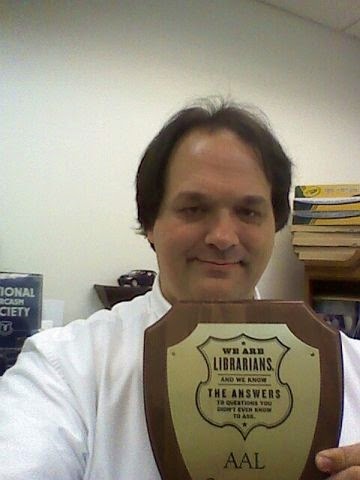 He was been at Bartow since February 2013 and has been an outstanding team member of Ask A Librarian since his arrival. He has also been nominated for several exemplary reference awards. Paul volunteers to cover shifts needing last-minute help on the Collaborative Desk. Paul's eagerness to help librarians and staff from around the state shows true dedication to the collaborative program. His virtual reference knowledge reaches customers in a true time of need. Paul is a crucial member of the Ask A Librarian program. Please help me congratulate this month’s SuperStar winner, Paul Wartenberg from Bartow Public Library.